The Bristol-Palace Hotel in the spa town of Karlovy-Vary, Czech Republic, served as an inspiration for the setting of Anderson’s latest film. I confess. I am a fan of the films of Wes Anderson. Although my infatuation with all things Anderson began with the very first film he co-wrote with his friend Owen Wilson, the offbeat but endearing Bottle Rocket, it wasn’t until 2001 when The Royal Tenenbaums came out that I realized I had found a director whose oddly surreal view of life resonated with my own. And while a few Anderson films since then have failed to engage my passion (notably The Life Aquatic with Steve Zissou, a sodden misstep in my view) more often a new Anderson project is cause for celebration. Moonrise Kingdom, for instance, in 2012, featured all the elements that make Anderson’s vision unique: a flawed but likable hero trying to negotiate a trajectory through the jungle of reality, gentle humor, great music, and meticulous set design. Anderson excels at creating on film worlds as finely detailed as a Faberge egg yet emotionally complex and surprisingly buoyant. His most recent work, The Grand Budapest Hotel, released this past spring, is a remarkable fairytale for adults. Set in a fictional European alpine state in 1932 during a respite between two wars, the film evokes the elegance and civility of a lost era. The hero, Monsieur Gustave, is the concierge at the Grand Budapest Hotel. The plot involves murder, stolen art, and exquisite pastry. Ralph Fiennes, as M.Gustave, is marvelous. The pace is brisk, the dialogue snappy, and all of the characters bring something to the party. But perhaps top billing really should go to the hotel itself, which Anderson devised after researching and studying archival photos of grand European hotels at the Library of Congress. 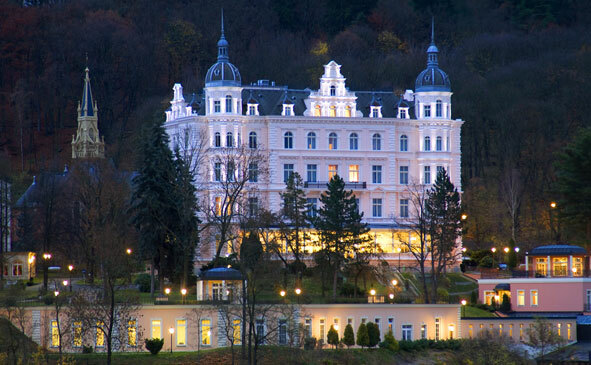 One of the inspirations for the Grand Budapest Hotel was the Palace Bristol Hotel in Karlovy Vary, Czech Republic. For the film Anderson had several small scale models of the hotel produced, including one fourteen feet long and seven feet deep. I never wanted a doll house as a child, but I find myself yearning for that pink hotel. Of course, few these days can afford the sort of extravagance that flavors the Old World vision suggested in parts of the film. But it isn’t simply the trappings of wealth that give the world portrayed in The Grand Budapest Hotel its timeless charm. It’s the passion for civility, the idea that good manners and kindness clothe any human with dignity. And that without those things our haloes dim, our lives lose something intangibly precious. And so it is with fairytales. There’s more to win than the crown. There’s more to lose than the throne. Happily ever after is the flimsiest of predictions. But to strive for perfection in the face of inevitable decline is perhaps the last best hope for humanity in a graceless age.